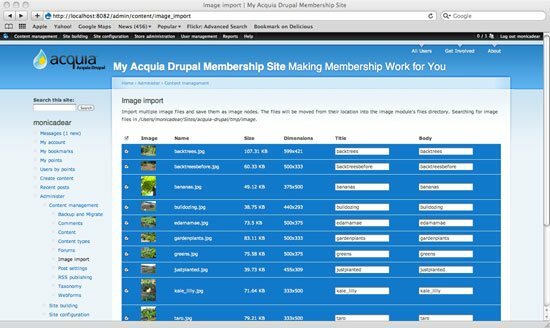 If you’re building a website for a client or yourself that requires a number of images to be presented in a gallery format — for example, if you’re a web designer, photographer, sculptor, painter or graphic designer — Drupal has some out-of-the-box solutions to help you organize and present your information. Professionals who work on a visual medium often need help presenting (and possibly monetizing) their work, and an online gallery is a great way to do this. Perhaps you could also make the images available as physical products or digital downloads in an online store as an added option. 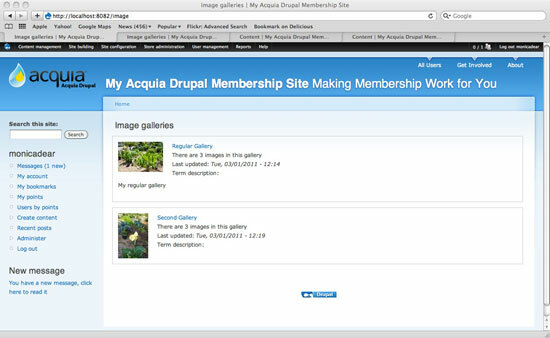 This guide will show you how to develop a portfolio/image gallery website using the popular content management system, Drupal. 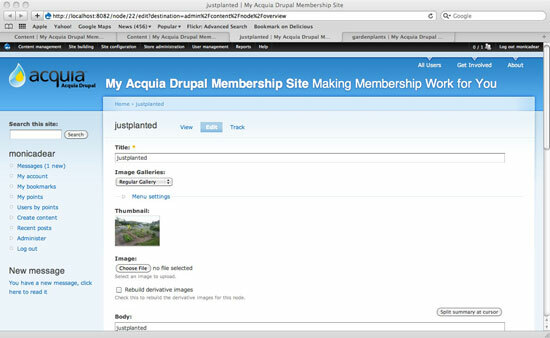 For this guide, you will need basic working knowledge of Drupal and a clean installation of the Acquia Drupal distribution ready to go. 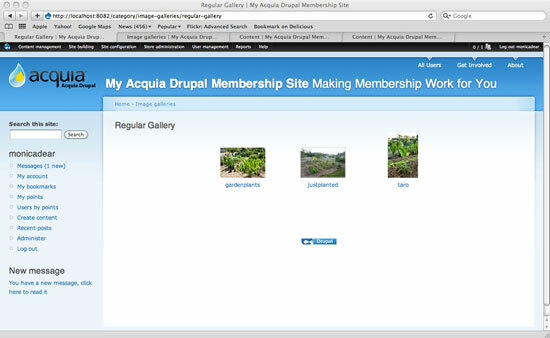 Below, you’ll be instructed to navigate to certain sections of Drupal. 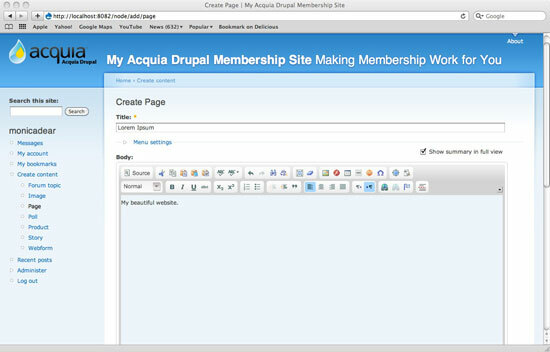 You will have to replace http://example.com with your domain name where you have Drupal set up. 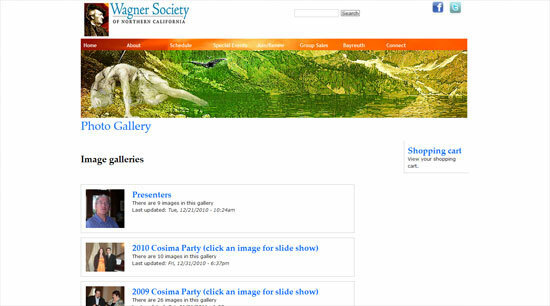 The typical project to display in a gallery-style website would have specific fields that display only on a per-project basis. These could include things like the image itself, the image’s title, the creation date, the medium and a description of the image. Go through the body of work and identify the types of information that are important to display for each item in the gallery. You may be able to skip this step if all you need is the title and a description of the gallery item. 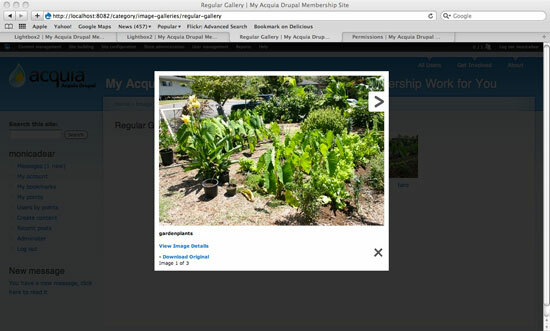 This will enable you to collect more information about each image (again, specific to the type of gallery being displayed). The default version lets you add a title and description. Because we enabled the Image Attach module, you can therefore attach an image to this node. The following describes how to upload an image from your hard drive, and assign it to its gallery (if it’s destined to have one). If you have a number of photos to upload at the same time, you could first put them all in one folder on your desktop or hard drive to make them easier to organize and access. 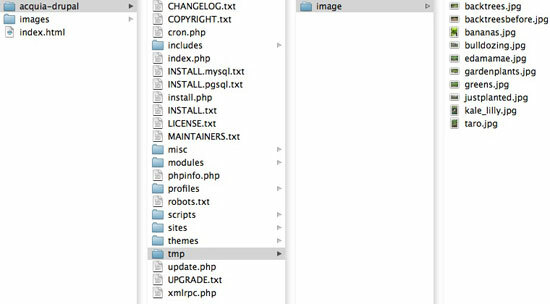 Follow the instructions to create a “temporary” folder somewhere in your web server. 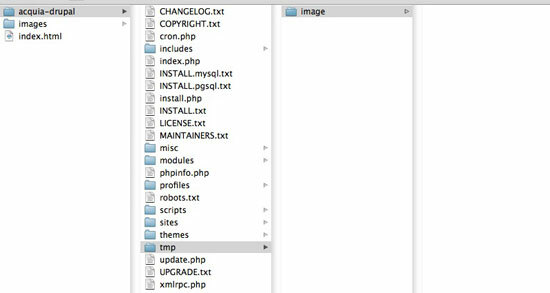 You may need to use FTP to create the folder (especially if you are using shared hosting). 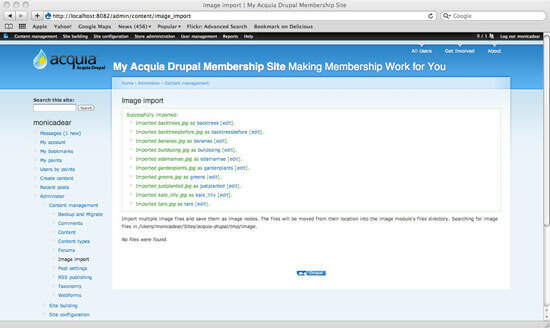 FTP all of the images that you want to make available to your Drupal website, putting them in this temporary directory. 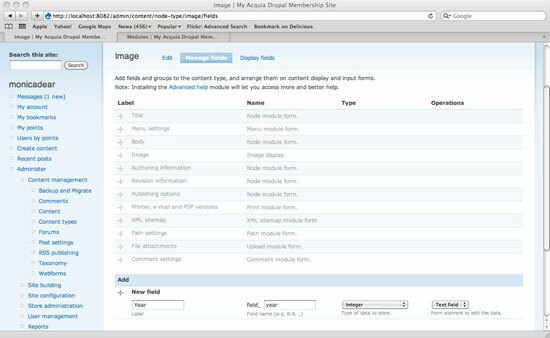 Note that you can automatically create new image galleries by creating sub-directories. For example, with the path tmp/image/gallery1/foo.jpg, the image foo.jpg would be part of gallery1. You can use the Select button at the very top of the list to auto-select all of the images. After the images have been imported, you’ll receive a confirmation. Review which of the most recent items have been moved over, and make sure that any new images are assigned to the correct gallery. For example, I am assigning this particular image to the “Regular Gallery,” which is in the dropdown list right under the title of the image. You can also specify whether or not the page should appear in the “Primary Links” menu, which is usually found across the top of every page. Lightbox 2 is a very nice way to present photos on a website. It allows you to upload images to the Image Gallery; and then, when a user clicks through the images, the images come up as a modal window with an arrow on either side of the image. It’s worth briefly reviewing the available options for Lightbox. For the gallery we’re working on, we won’t change the default settings much. 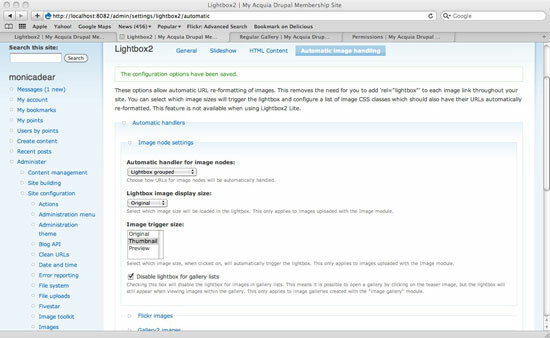 Set the Automatic handler for image nodes option to be Lightbox grouped. This means that the images will be grouped together but appear one at a time, with “Next” and “Previous” arrows and a dark shadow behind them. Finally, the uploaded images themselves will appear in Lightbox format if you click on one of the thumbnails in a gallery. I use Ubercart to handle user payments. This software is free and open source, and it allows you to sell products on your website. The products could be digital, such as high-resolution JPEGs (like screensavers) or PDF reports that are unlocked upon payment. Or they could be physical, such as signed prints, t-shirts, mugs, calendars or signed photos, which require shipment to the buyer. Perhaps the site owner wants to sell subscriptions to the website, in which case the product would be a “membership package” that directs the purchaser to a “paid members” section for a fixed amount of time. If you use Ubercart, you’ll need a payment gateway such as PayPal or Authorize.net to accept payments. If you choose to accept payments directly on your website, you’ll also need to purchase an SSL certificate to make data transmission from user to your web server (and back) more secure. 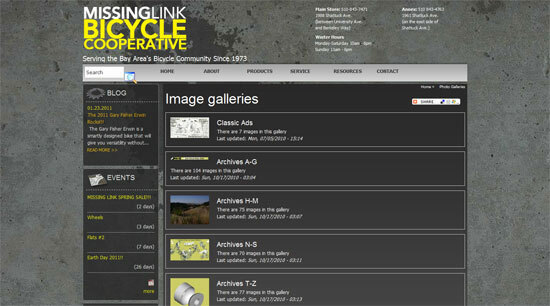 Images of logos, products and events for a bicycle co-op. Images of members of an organization devoted to the famous composer.